"Flower Sword" Vista is the fifth division commander of the Whitebeard Pirates. Vista is a black-haired man with a mustache and a top hat. His mustache is black and curly. He wears a shirt with a diamond stripe pattern near the top that reveals some of his chest as well as a cape. He is also quite muscular and wields two sabers, one in each hand. Like all division commanders of the Whitebeard Pirates, Vista seems to be very loyal to Whitebeard. He also seems to be modest. 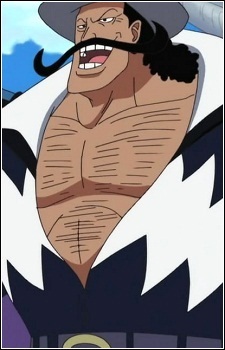 As commander of the fifth division of the Whitebeard Pirates, Vista has authority over the lower-ranking subordinates. He has incredible reflexes, and is able to move very fast since he immediately backed up Luffy against Mihawk. He uses two swords. He also seems to be a swordsman of tremendous power, shown by the strongest swordsman in the world comments that only a fool would not know Vista's name.